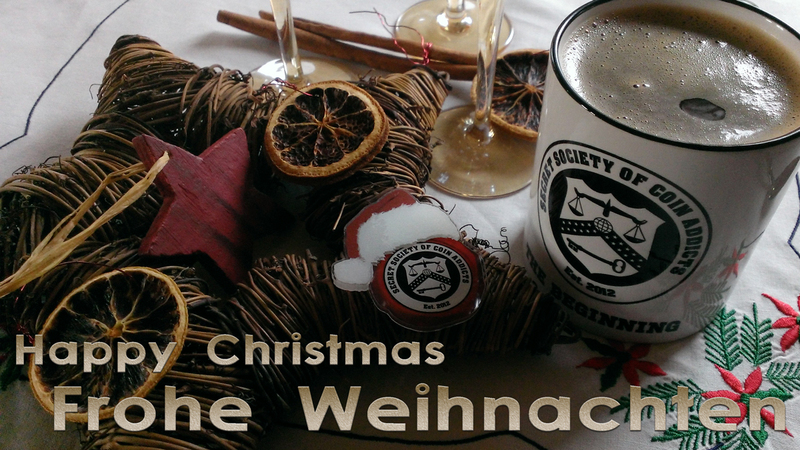 Since July 2012 the Blog Die Mietzecacher is online. Here you can read about the little geocaching adventures of “Kitty Maggy” and her “Tomcat Andy”. 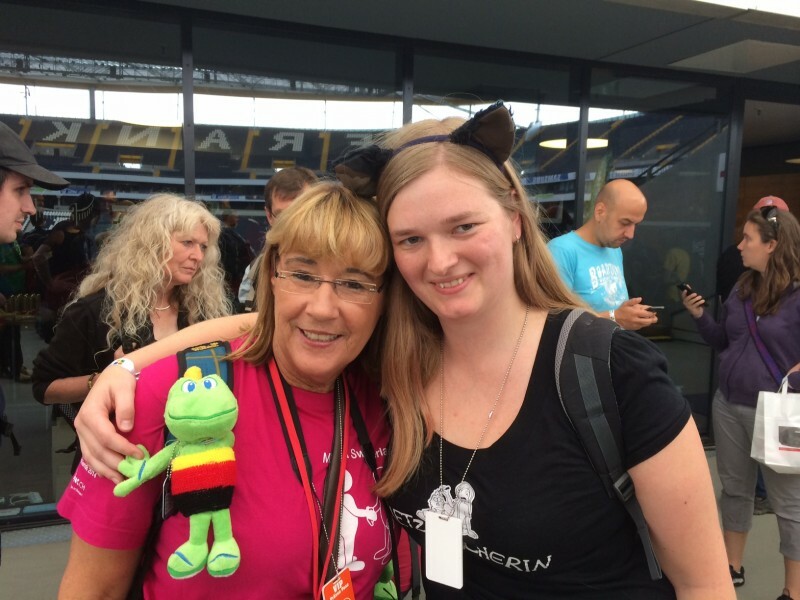 You can meet both at Events and you will recognize them at the cute little self-made cat-ears. While Maggy prefers heavy Mystery-Geocaches Andy loves the T5 adventures. Many of their funny and exiting adventurs are drawn in little Comics by „Mietzecacherin“ . The first publish of such a comic was in 2011 in the Geocaching Blog Franken. But the 25 year old young lady, who has finished her studies in december 2014, has got more talents than only drawing comics. By the way she has become one of the famous coin-designers of Germany, too, while she is likes always staying in the background modestly. 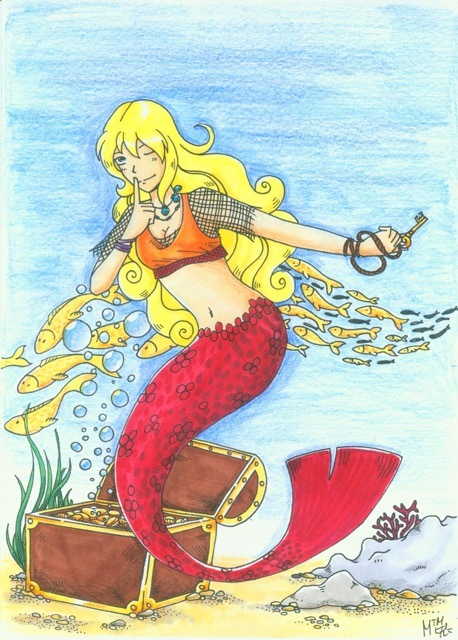 She started a few years ago by designing Avatars for geocaching-stamps. Meanwhile she has got a lot of customers who let design their artworks for personal tokens from Maggy. coming over to Skulls and DevilzWalls. Inbelievable that these are the designs of this young woman behind the standing lines at the stands during Events. What’s on with the big talent of Maggy and how much times it is taking? I’m glad that she was so kind to make an interview with me. How did you find your logo and nickname „Mietzecacherin“? I know, you’re collecting rare, older cat geocoins. Since I met my boyfriend Andy, I like cats. He has a big faible for cats and to dogs too and he has infected me with this animal love. When we read about geocaching in the internet and on TV, our nickname was born immediately „Mietzecacher“. So our trademark was born. 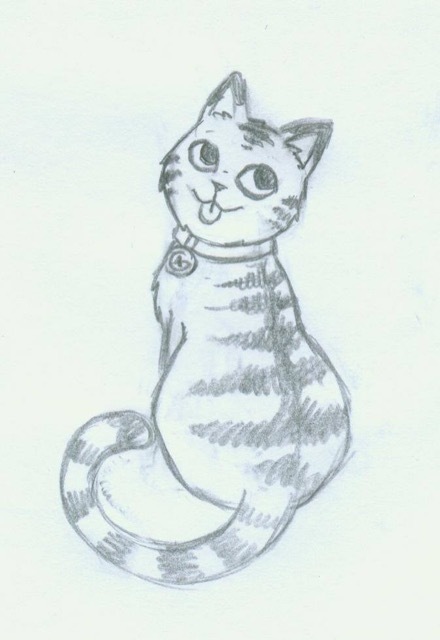 When I recognized how many beautiful geocoins with cats, little kitties, are still there I felt in love with coins. When did you discover your talent for drawing? It already started in my childhood. Because I didn’t hid myself behind Game Consols and WI , I was sitting on my little table and occupied myself with drawing and tinkerin. 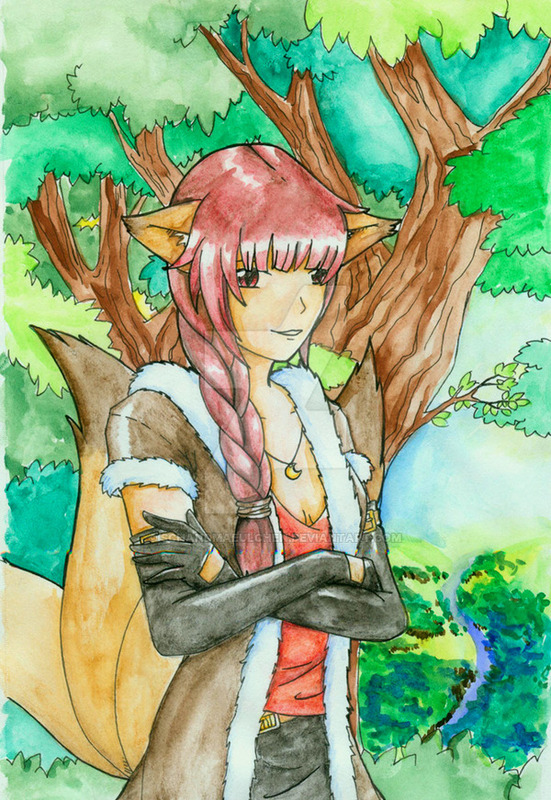 When I visited school I started to draw Mangas, in was very „in“ at that time. I bought my first book with lessons to learn drawing. Since that moment I knew why the lines in the exercise books have got white spaces at the edge ;-). Since that time I’m used to draw whereever I am. I used online turtorials to improve my drawings. The best exercises are the orders of my customers because it’s damned heavy to show the charackter of a person in a sketch. How did you get the idea with your comics? Like every good idea it just happened. During nightcaching the story with the cat happened and when we returned to the car I thought it would be a funny comic. After sleeping a night I made my first comic „Stage 1“. 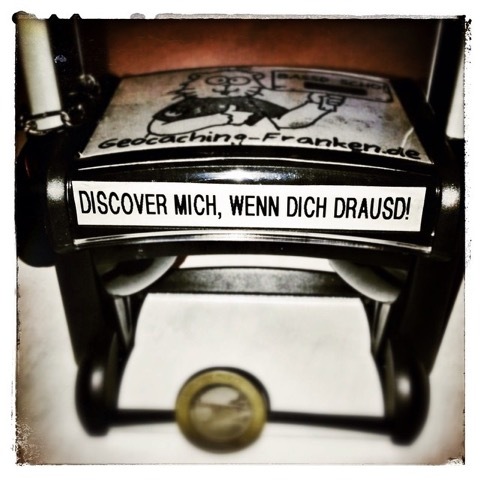 Geocachig`n Franken Forum liked it, this gave me the motivation to draw more comics. In 2012 I made our own Blog. How was your first Geocoin „born“? 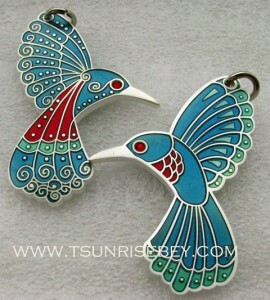 I started with participation at a Geocoin-Designer-contest. 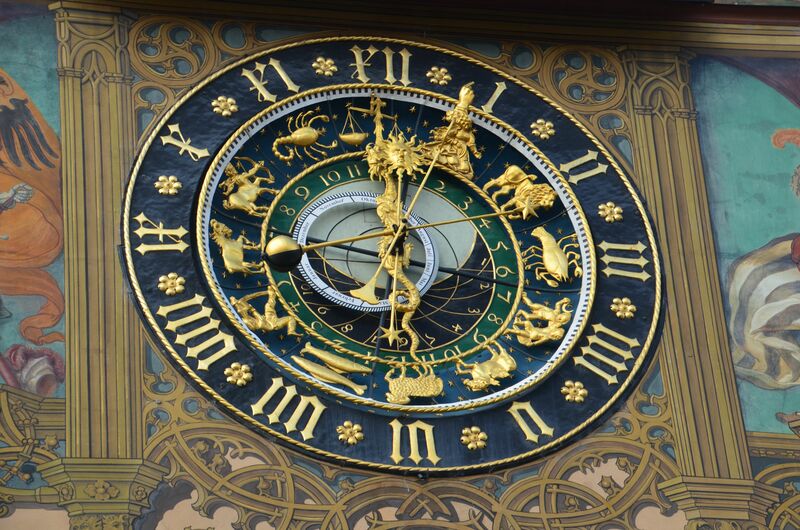 With the design of Zodiac Clock Geocoin I even won this contest. But for a while nothing more happened. But I already had the fever to make Geocoins. 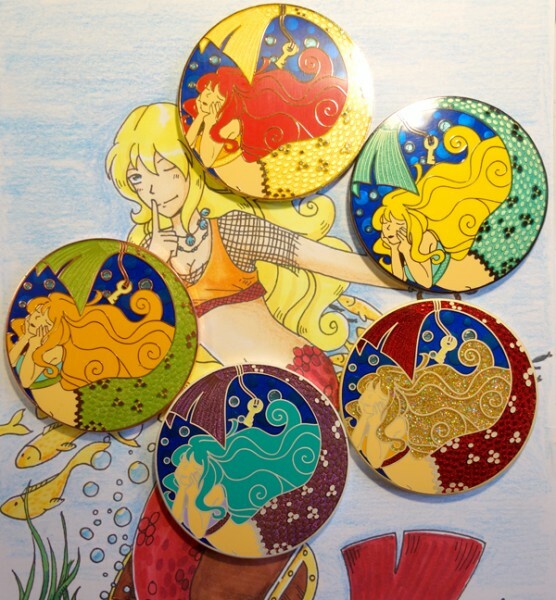 Because I admired Claudia and MyGeocoin and her designs I sent her a few of my designs and sketches. I was happy that she wanted to make a coin with me, we started with „Lucky Coin“ for New Year. 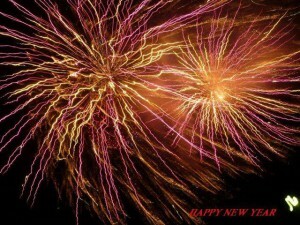 There were a lot of sketches sent to each other but finally at the end of 2012 I could hold „Good Luck! 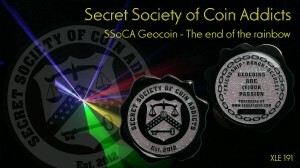 Geocoin! in my hands. Claudia was so kind to name the little pig after me 😉 „Maggy“. At the same time Ernie has seen our Avatar and he send me an email to ask me if I want to make a coin with him. 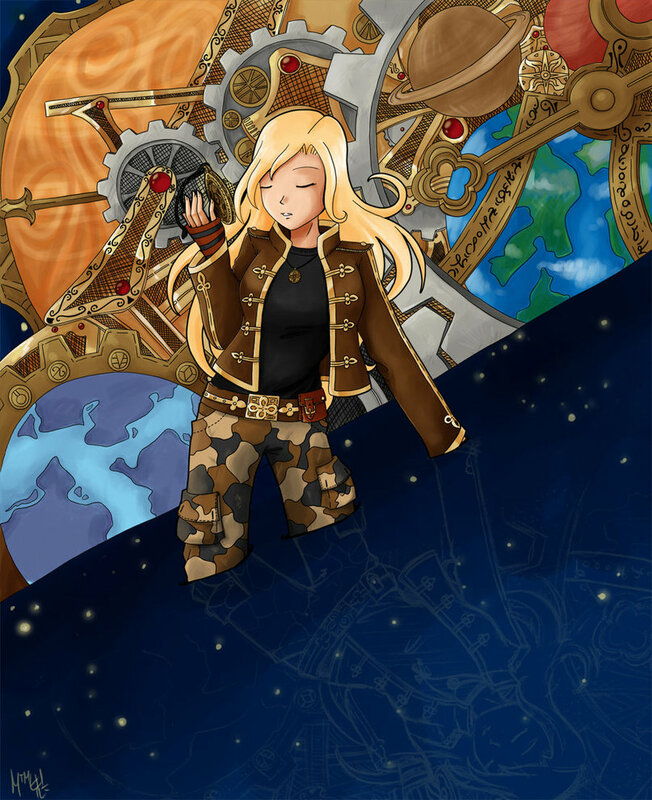 So Nixie Geocoin was born. How long does it take to design a coin and the artworks? I can’t give a general answer. One coin is designed quicker than the other. 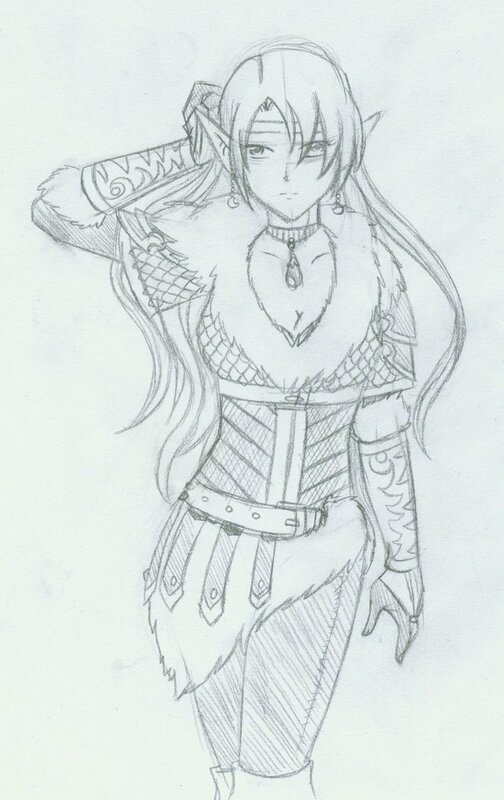 Meanwhile I’ve got routine, when there is a concret idea with sketches the artworks can be ready within a few hours. But last not least a coin needs several weeks because you can’t force a good idea. You can start to draw- but you need tohave the spirit for a real good idea and this happens often when you don’t think of it. What do you like most during desinging coins? The biggest fun is while imagening and sketching, when I can make experiments with the design. And the absolut highlight of course is holding the first samples in the hands. Each time I’m excited when an artwork is at the factory. The more time I needed for it the more I’m excited: to see if they could realize my ideas. You can’t imagine what can go wrong there! How many coins did you already design and which coin is your favortite? I could see at the s.s.o.c.a. Wiki that there are meanwhile 35 coins that I’ve designed. You can add several coins where I helped with the design. For example the Fire-Rock guitar( I made new flames) or the Big Äppl Geocoin ( I helped on the backsite). My favorite coin until now is the Cosmolabe Geocoin. Not only because it was of my first coins, but also because it is a very special coin with all her movable parts. I’m working with two programs. I use an older version of Photoshop fort he pixel grafics and Corel Draw for the VecotorGrafics. Very helpful is my grafic tablet. I connect it with USB, it transfers all the lines to my PC. The top oft the pen is made of plastic and it can „feel“ how much I’m pressing on it. So the transfer of thicker and thinner lines to the PC is working. Why don’t you make yourself independ with your talents? Ok, I’m a little bit independetly. But the designing is not my main occupation. I don’t want to give up my main occupation because I’ve got a lot of work to do as an engineer. Drawing and designing is my by and good compensation. I don’t want to destroy that..
Is there something about you’re very proud? Auf was bist du besonders stolz? 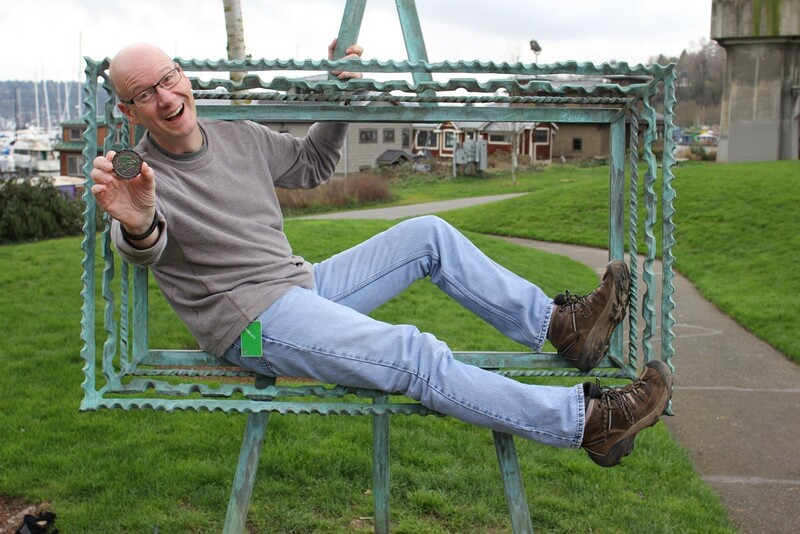 Even if this did not happen during Geocaching I’m proud that I could win a special designer contest in 2011. It’s the design of a Beer Mug for the „Nürnberger Volksfest 2011“. 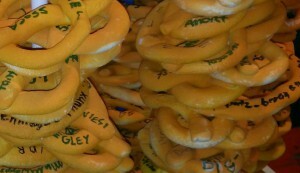 My design was printed on 1700 beer mugs and on the flyers too. 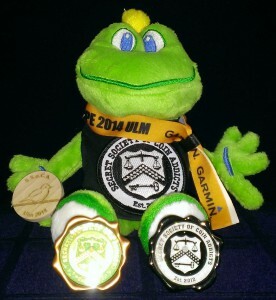 And I’m still proud of my first geocoins, because I still like „GoodLuck“ andNixieGeocoin. And I’m always proud when there is a special auction around my coins like it was at Xanten with my „Heldenlegion coins“. Of course I do- But not so often like in the beginning because we’re trying some new hobbies, like Ingress. But we still are geocaching and we like to visit Events. But meanwhile we are choosy. Thank you so much for this interview, Maggy. Even if I’m knowing „Mietze“ since a longer time it was exciting and varied to write this article. I’m admiring her big talent and I like that she is always timide, kind and helpful. The future will bring big tasks for her. She already has got two orders to design for Mega-Event-Coins next year- it won’t stay the last! 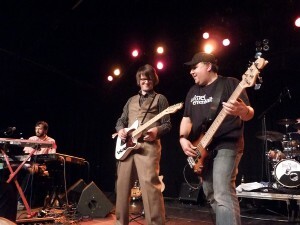 In the name of the S.S.O.C.A many thanks to Wuselelfe for the great interview and introduction to Maggy „The Mietze“! If interested you can see the german version here. Am 30. September 2001 setzte Jon Stanley (Moun10Bike) die erste Geocoin in einem Cache aus. Heute, knapp 14 Jahre später, sind Geocoins aus dem Cacheralltag nicht mehr wegzudenken. Über 8000 unterschiedliche Designs erfreuen Cacher und Coinsammler aus der ganzen Welt. Wuselelfe hatte die Gelegenheit, sich mit dem Schöpfer der Geocoins auf dem Giga-Event „GeoXantike“ in Xanten zu unterhalten. Den Originaltext des Interviews mit Jon Stanley findet ihr exklusiv hier. Auf dem Blog von Geocaching Baden-Württemberg könnt ihr die deutsche Übersetzung lesen. Herzlichen Dank an Wuselelfe und Moun10Bike für dieses tolle Interview und die schönen Fotos. On the 30th of September, 2001 Jon Stanley (Moun10Bike) left the first geocoin in a cache. Today, just 14 years later, geocoins are very common and polular in the geocaching community. 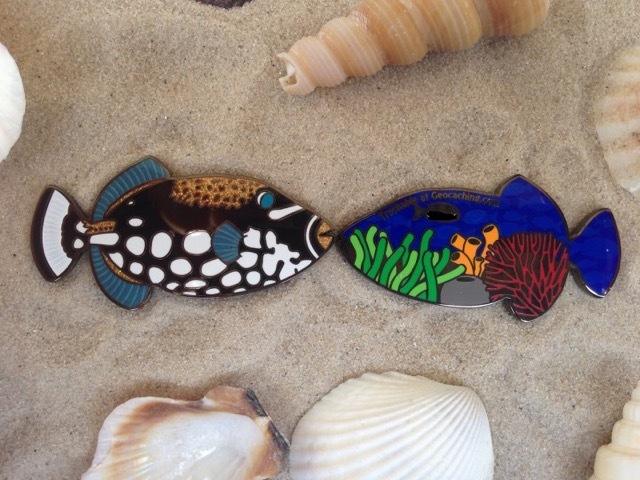 With more than 8000 different designs, cachers and coincollectors alike can choose out of a huge variety. 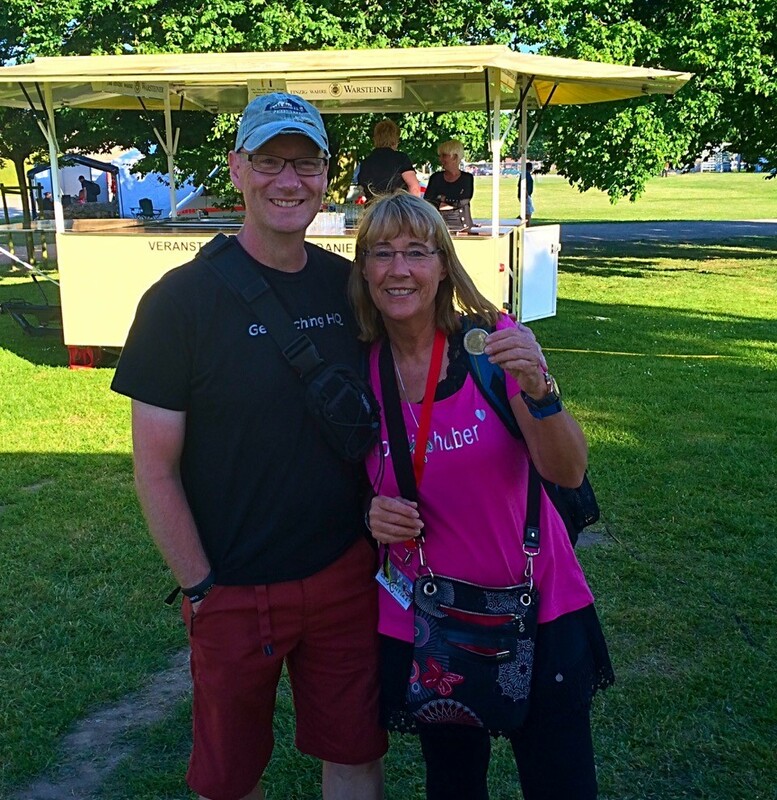 Wuselelfe had the opportunity to talk to the creator of geocoins on the Gigaevent „GeoXantike“ in Xanten. You’ll find the original text of the interview with Jon Stanley exclusively here. 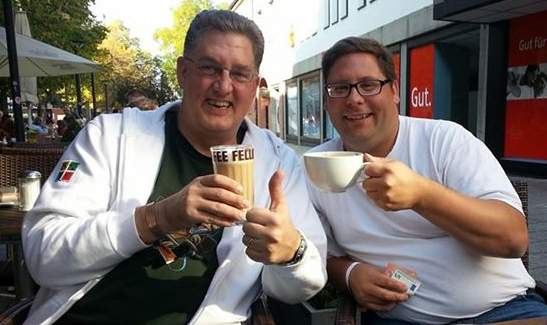 On the blog of Geocaching Baden-Württemberg you can read the German translation. Many thanks to Wuselelfe and Moun10Bike for this great interview and the nice photos. 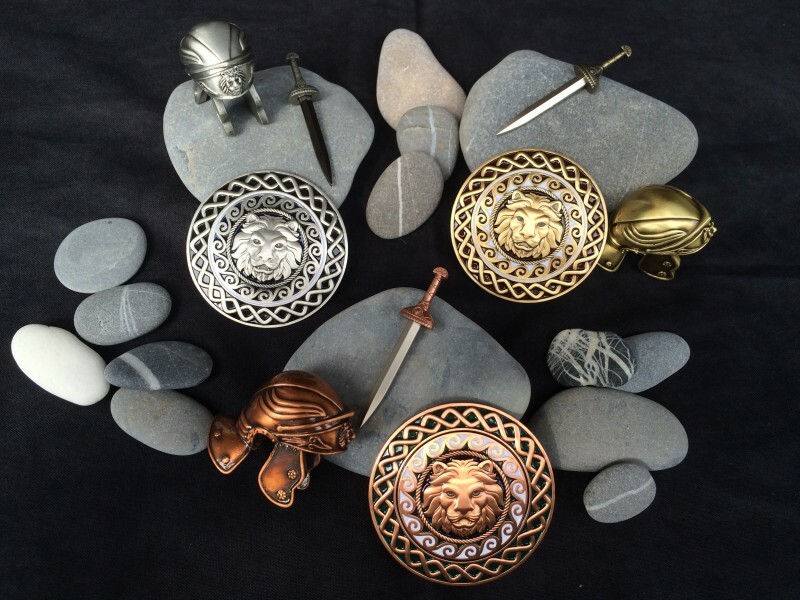 What would be geocaching without the world of geocoins and trackables? 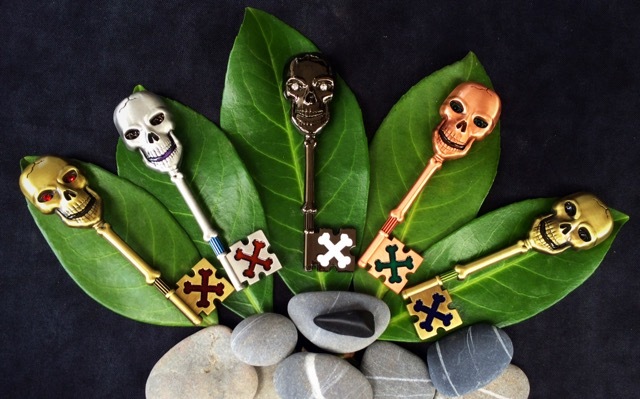 These colored, glittering, mostly metallic travellers which are making the treasure hunting more attractive and exciting and which have a lot of fans, called the coinaddicts? Thanks to a wonderful idea of a geocacher, who is doing that hobby from the first hour: Jon Stanley aka Moun10Bike. In his opinion he is on the verge of old age, he’s celebrating half a millennium this year. Jon is living near Seattle together with his beloved wife Shauna and his little son Jameson, „Moun10Tyke“. The household seems to be a little zoo, they have two dachshunds and three cats. He still loves mountan biking and of course geocaching, also computer, dual-sport motorcyling and just being outdoors. Since march 2009 he is working for Groundspeak as a system analyist. Already in june 2000 Jon was hiding the first geocache of Idaho and since 2001 he is working for groundspeak as the first reviewer, because Jeremy Irish asked him for help. To celebrate his 100th find Jon had a great idea: he wanted to leave a personal sign in a geoache and let made a little medaille with his logo, the Moun10Bike. Because I would visit the german GIGA GeoXantike at Xanten I decided to ask Jon for an interview. He was very kind and friendly and he even gave me his phonenumber to contact him during the event. 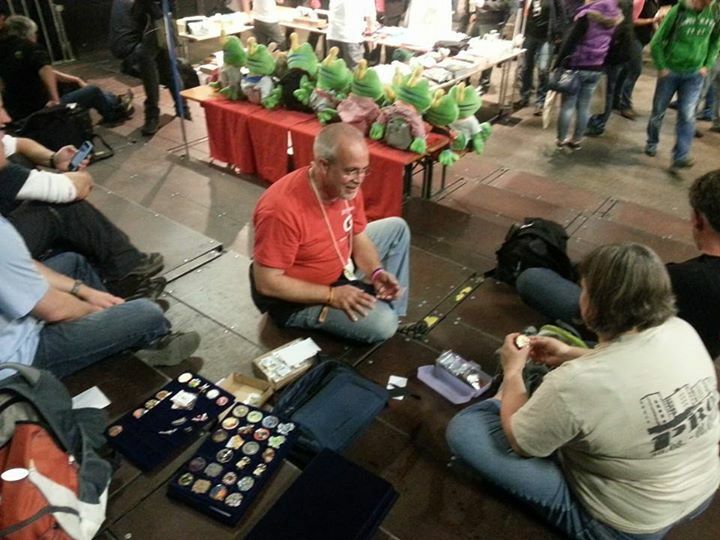 I’m really addicted with geocoins, so I was very exicted that I would meet him and I couldn’t expect to meet the „Father of the geocoin“ by himself. Despite physical handicaps I was able to make a very special helper job at the event: I was responsible to take care oft he Lackeys during their waiting of the marching in into the Roman Arena. 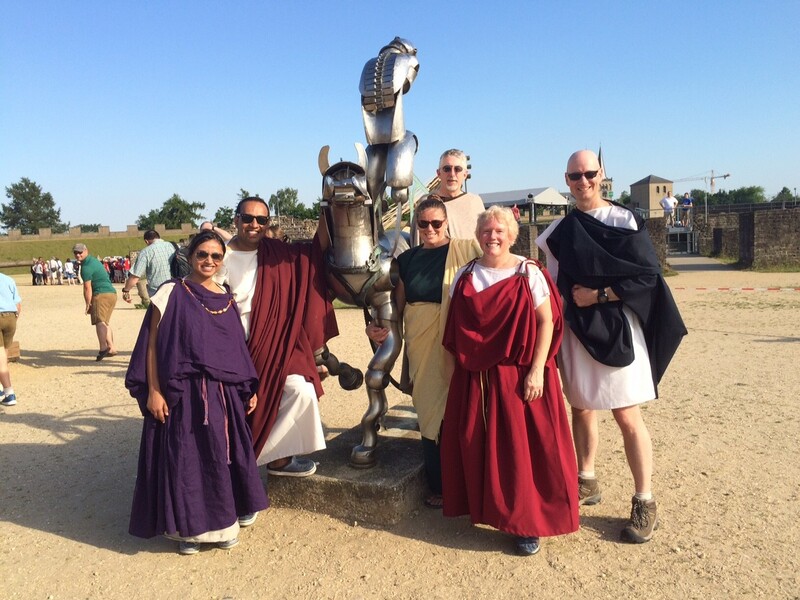 While Annie, Cathy , Narendra and Jon were dressed in Romand clothes, I could speak the first time to „Moun10Bike“. We should finish the interview on the next evening. 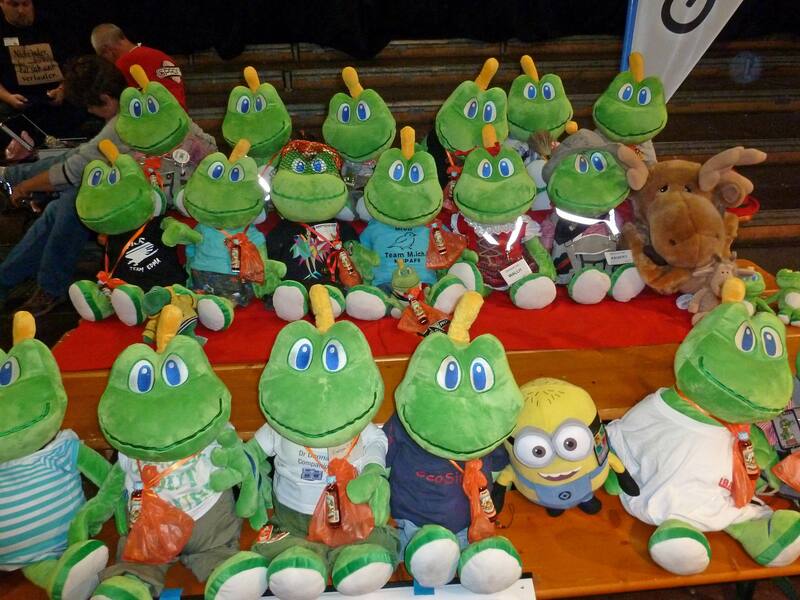 Since 5th of September 2000 you’re searching geocaches, soon we can celebrate 15 years Moun10Bike. Where/when did you hear from Geocaching and how did you feel when you found your first cache? When did you buy your first GPS? I have been very interested in maps and geography since a young age, and so when receivers became cheaper and more readily available, my parents gave me one for Christmas – a Garmin GPS 40. That was in 1995. Selective Availability (SA) was still on back then, and the 40 was a single-channel receiver, so accuracy was limited. Nevertheless, I used it extensively for mapping mountain biking trails. Because of my interest in GPS technology, I was an avid reader of the newsgroup for satellite navigation, sci.geo.satellite-nav. There was a lot of buzz starting in early 2000 about the upcoming removal of SA, and when that moment finally arrived, a man named Dave Ulmer posted the idea of being able to hide a container in the woods and now being reasonably able to direct someone to it using coordinates. A couple of days later he did just that, and geocaching was born. The idea captivated me, and so I waited a few weeks for the snow to melt near our family cabin, then I headed up to the top of a nearby mountain and planted my own cache. That was June 17, 2000. It was a few months later that a cache popped up close enough to my home in Seattle for me to easily get to it. We were in the midst of shipping a product at work that summer, but immediately after the post-release ship party, I headed off to find that cache. That was September 25, 2000, and the hiders of that first cache that I found ended up being my future bosses – Jeremy Irish and Bryan Roth! Do you still seek geocaches, perhaps now with your family? 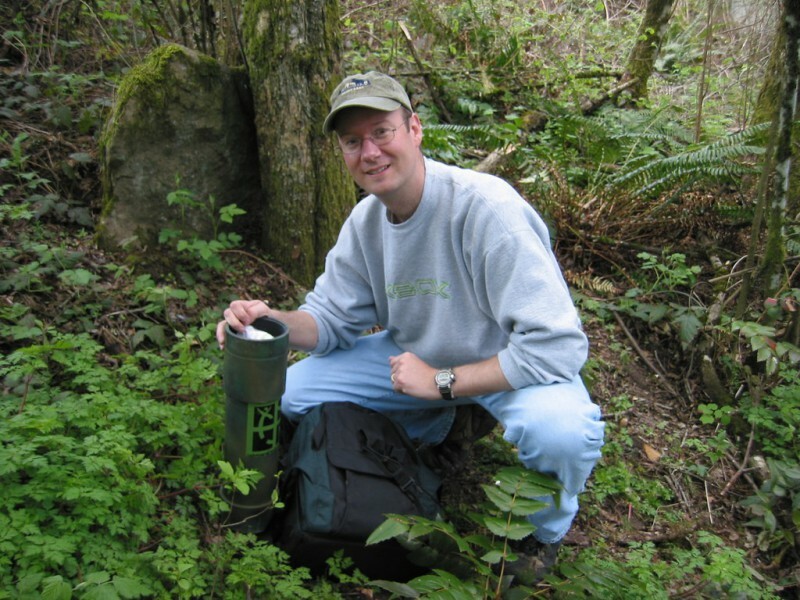 Yes, I am still a very avid geocacher! I have slowed down a little bit with family duties, but try to get out every day. My wife is not interested in the activity, and my son is only somewhat interested, but I can make him come with me. What was your motivation/idea to design a Geocoin? I was getting close to my 100th find in 2001 and wanted to come up with a signature item that was unique. 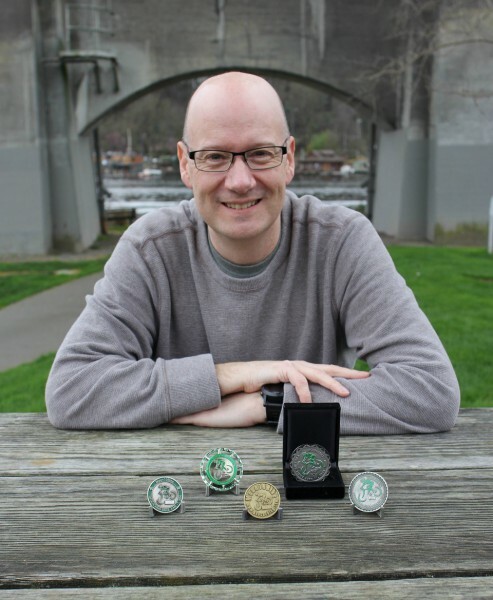 While attending Washington State’s first-ever event that summer, a fellow cacher mentioned the idea of military challenge coins. I thought that the cost would be prohibitive, but when I researched it online, I found that they could be produced for a reasonable amount. Furthermore, coins were durable, customizable, and easy to carry. I found a place on the Internet that would mint my designs and I ran with it! I wish I had known more about what was possible with coins back then – the minter I chose was not very knowlegeable – so that first design was very plain. 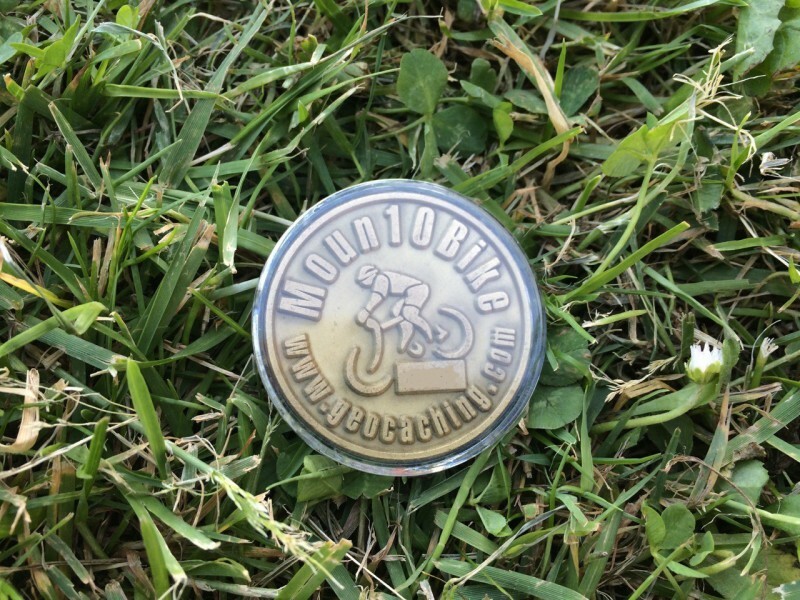 I took the Geocaching.com logo and altered it to work better on a round object (this was before the existing logo usage rules that prohibit alteration of the logo) and then used my own Moun10Bike logo on the front. To keep costs down, I only used color on the Geocaching.com logo side. It’s one thing to design a coin, but another to make the business with Groundspeak. Please tell me about contacting the HQ, how did it work with the tracking-number, icon, listing etc. . How was the process to establish geocoins for all? How could you convince Jeremy Irish for geocoins? That was actually all very serendipidous. I had come to know the founders of Groundspeak through my early activity in the game and my geographical proximity to them, then later through donating software to them to help get the business started. When I started planning my outing to get my 100th find, Jeremy expressed a willingness to join me, so we headed out together that day. He was just in the process of introducing Travel Bugs on the site and asked if I would like to track my geocoins as well. I of course jumped at the chance! He set up my first few coins for tracking and gave them their own unique icon. Later on, the system was expanded as more people became interested in having their own personal coin. Initially all other personal coins used the same icon, but then the system was enhanced to allow users to submit their own custom icons. What happened after you put your first coin into a cache? The coin stayed in that cache for just 3 days (which was pretty quick for back then) before being picked up. It was then placed in a couple of different caches by a couple of different cachers before being picked up by the people who still hold on to it to today. How many of your coins are still travelling? Technically, none – they have all been picked up and added to someone’s collection. While most are now collecting dust in drawers around the world, I would say that there are somewhere around 100 that are activly taken to events and logged. How many coins did you mint meanwhile? 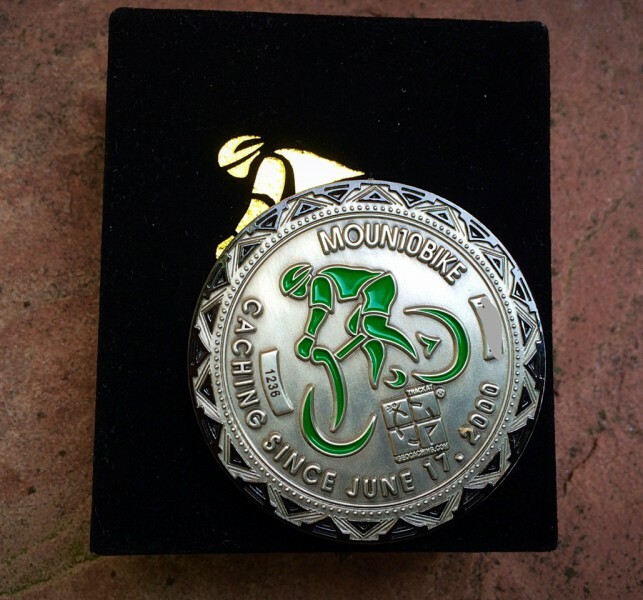 I have minted a total of 1300 Moun10Bike Geocoins at this point (plus 300 Moun10Bike Coinaments). I could read that you’ re also a famous coin collector. How many coins do you own in your collection? I was really into collecting up until around 2007. I then became a little disheartened at how commercial coins were becoming, and how little the coins being produced had anything to do with geocaching. I stopped actively collecting at that point and only collected personal coins that I received in trade from other cachers that I have met along the way. I have a soft spot in my heart for many of the old coins that I have good memories of. Other than that, I can’t say I honestly have a favorite. Do you still buy new Geocoins? Is there a coin which is a „must have“ on your seeking-list? I will buy coins that commemorate an event I am attending, but otherwise mostly avoid purchasing them. Every coiner has a big dream: to receive a Moun10Bike coin ;-). Is it still possible to receive/trade a coin with you? Absolutely! 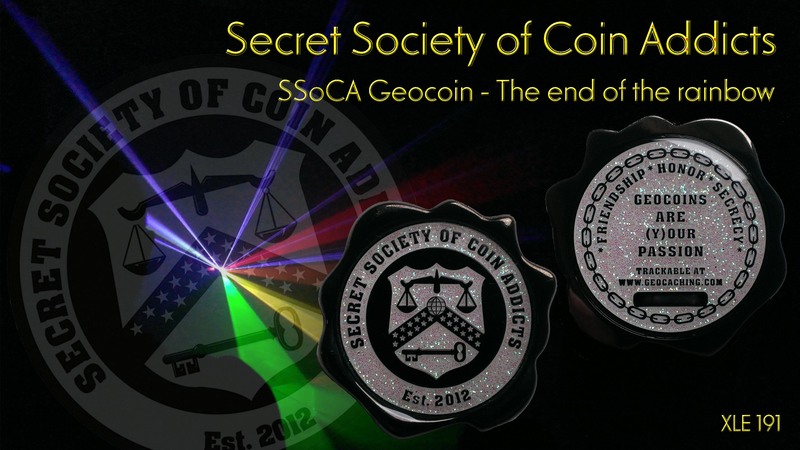 That’s still a very important aspect of geocoins for me. However, I only trade for other personal coins (no group coins, event coins, regional coins, etc.) – it’s important to me that each coin I collect tells a story about the person that I met and received it from. When you give a coin to a person you always keep the listing (is that true? ). Why? 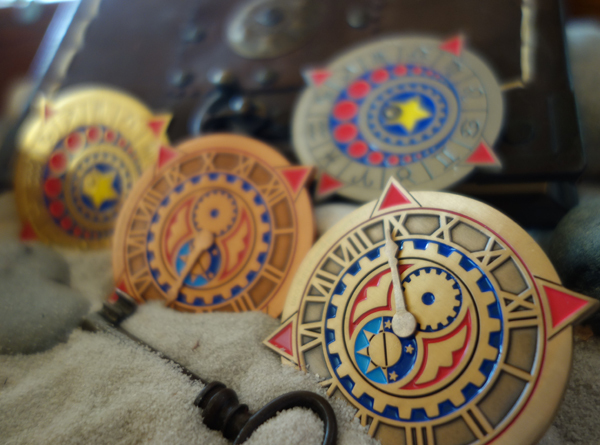 That is an artifact of the way the coins started out – trackables that were intended to travel. Just like Travel Bugs are activated by their owners, so too I activated my coins. It was only later when coins began to become collectible that people took them with the intention of keeping them, but I stuck with my original pattern of always activating them after sending them out. It’s too late to stop doing that now. Will you make a new/next Moun10Bike? It seems, September should be a good date for that ;-). I see that logic. However, I always wait until I run out of my previous version (or get close to running out) before I start working on my next iteration. May I say „congrats“ that you visit your first GIGA at Xanten. Have you ever been in Germany? Do you often visit Megas? I have been fortunate enough to visit Germany several times in the past, the most recent being in 2007 when I came over for a „conference“ with some fellow reviewers. I get to a couple of Megas every year (not to mention the Block Party!). Why did you choose GeoXantike for your visit? I am attending Project GeoXantike as part of Groundspeak’s Product Team. We will be running some user feedback sessions that we call „Guerilla Games.“ They are designed to get insight from our users as to how they would prioritize possible features of some upcoming projects are planning. 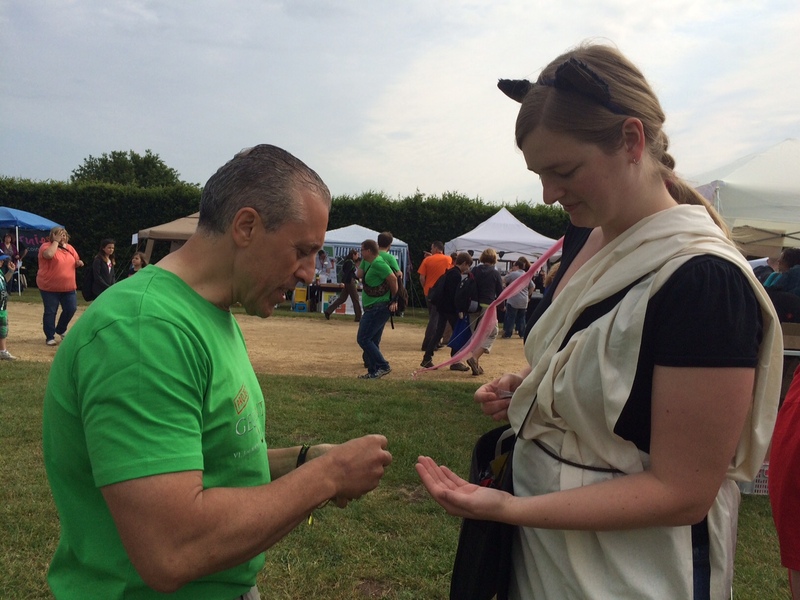 The German geocaching community is very important to us and we wanted to make sure that it was represented, so we picked one major German event, one major US event, and the Groundspeak Block Party as scenarios for running these games. This Giga was the one we chose! 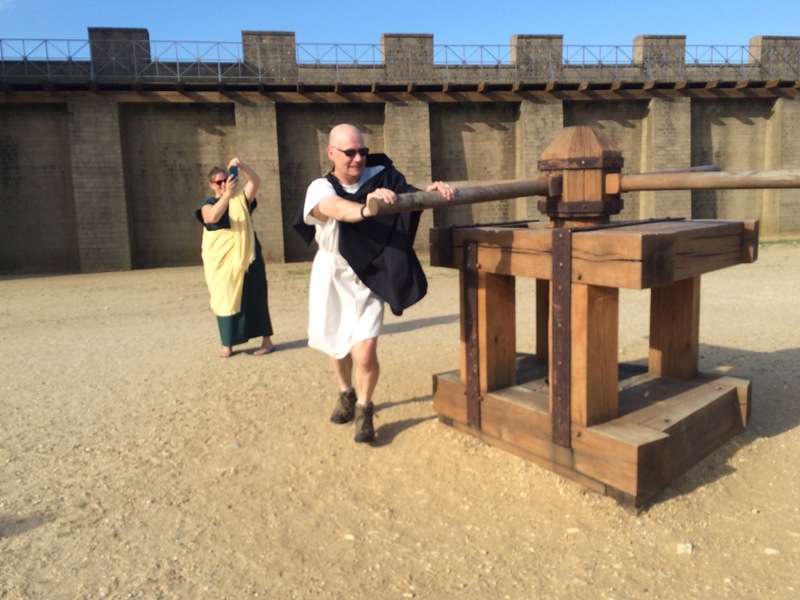 How do you like the GIGA at Xanten? It was phanomenal. When I’m talking to people about what makes a good geocache I think you need to have a qualitativ container fort he location and most importantly a nice location. This event was like that for events. It was a wonderful put-together event on a top phanomenal location like this Archilogical Park at Xanten, in which you want to come even if there wasn’t an event. And this event is so well done on top of it’s the best event ever I’ve been to. I enjoy even to see anything, enjoey to be with the people, to see everything and have a chance to visit the geoacher from other countries, it was wonderful. How well considered everything. 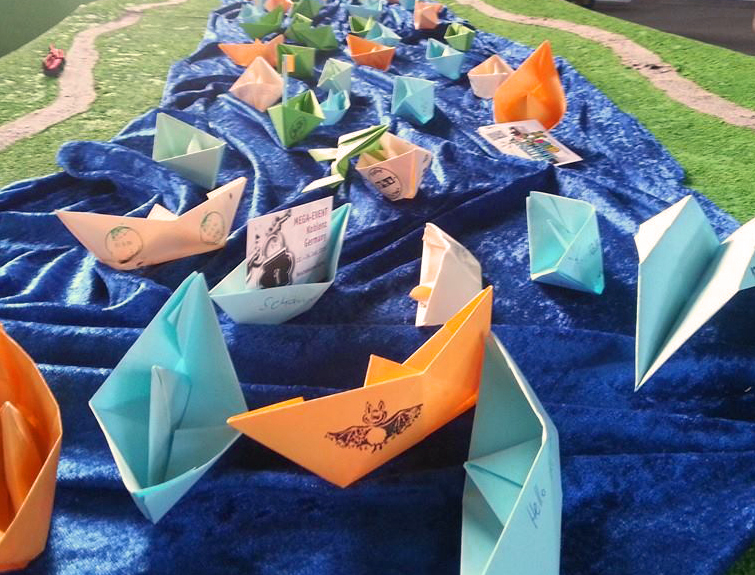 They are events exspecially for children. I have my head of for these organizers, they did a great job. It is even better oragnized like our Block-Party. I’ve seen that there were a lot of helper, they are all geoachers. I like that and that’s wonderful. At the end of the interview I was allowed to hold the first Moun10Bike Geocoin in my own hands. More than 100 people could take a look at it this weekend. Finally the great moment arrived: Jon traded with me my personal Peace Turtle Geocoin and gave me a small case, covered with black velvet and a golden mountainbiker on it. With a quickly beating heart and trembling hands I opened it slowly: my own Moun10Bike Coin – a dream came true. Mit diesem Interview möchten wir unsere Serie über bekannte Coindesigner fortsetzen. Zahlreiche Eventcoins, wie die der Nordseetaufe, die Geocoinfeste in Köln und Ulm, die Giga-Events in München oder Xanten, Geocoins aus der Serie der deutschen Reviewer, Schafe, Eichhörnchen, Fledermäuse und nicht zuletzt auch die Geocoin der S.S.o.C.A. – Claudia Siebauer von MyGeocoin ist bekannt für creative Geocoindesigns. Vielen Dank an Claudia, die sich gern unseren Fragen gestellt hat. As we continue our series of Interviews with Coindesigners. 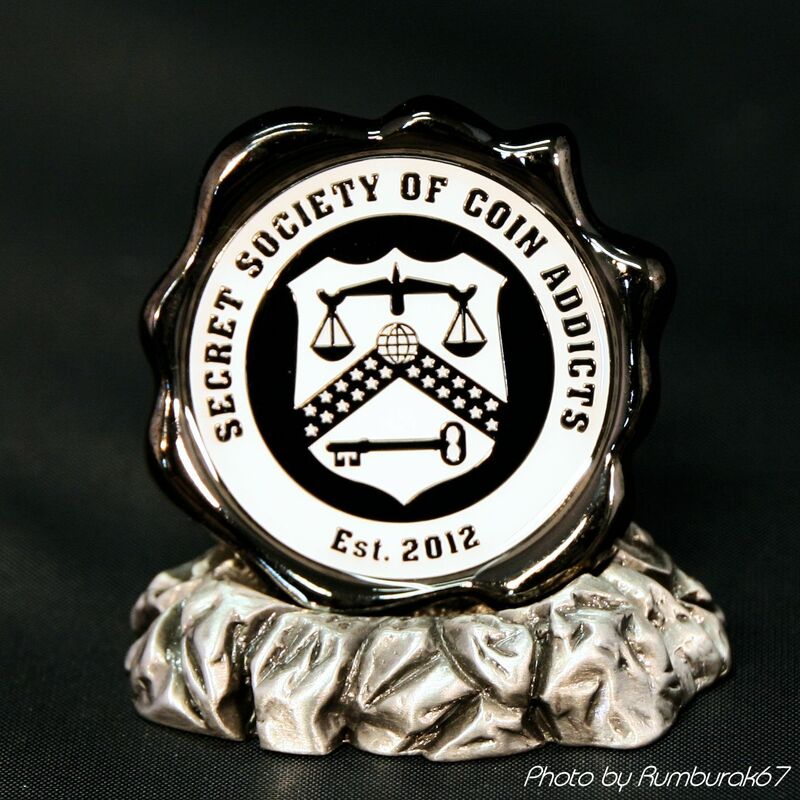 Many eventcoins such as the Nordseetaufe, the Geocoin-Festivals in Cologne and Ulm, the Giga-Events in Munich and Xanten, geocoins from the series of the german reviewer, sheep, squirrel, bats and not least the geocoins of S.S.o.C.A. – Claudia Siebauer of MyGeocoin is known for creative Geocoindesigns. Thanks to Claudia who spent her time answering our questions. Interested in this interview with Claudia Siebauer? Please click this link. Please see english version below! Manchmal treffen sich Menschen, bilden einen Verein oder eine Vereinigung und arbeiten gemeinsam an Zielen, die man sich gesetzt hat. Und dann kommt man eines Tages an einen Punkt, an dem man – weder für sich noch für die Gemeinschaft einen gemeinsamen Weg oder Konsens findet und für sich – entscheidet, dass es vielleicht besser wäre diese Gemeinschaft zu verlassen. Auch die SSoCA hat in der Vergangenheit solche Erfahrung machen müssen und das ist auch erst einmal gar nichts außergewöhnliches, sondern ein allzu normaler Prozess. Auch in unserer kleinen Gruppe menschelt es nun mal untereinander. Die Gründe, diese Gruppe zu verlassen, könnten unterschiedlicher nicht sein und sicherlich ist es manchmal auch bedauerlich, wenn ein liebgewonnener Weggefährte sich zu diesem Schritt entscheidet. Was bleibt ist manchmal eine Lücke, die erst dann auffällt, wenn sie da ist. Manchmal mag der ein oder andere sogar froh sein, dass es eine Reibungsfläche weniger gibt. Doch bleibt da eine Sache, die alle „ursprünglichen“ Gruppenmitglieder verbindet. Mit der Gründung der SSoCA haben wir uns seinerzeit entschlossen, eine Coin mit unserem Gruppenlogo zu entwerfen (siehe dazu auch den Beitrag im SSoCA-Coinwiki) und auf den Markt zu bringen. Neben den „normal“ erhältlichen Versionen wurde auch damals die Edition „The Beginning“ aufgelegt. Diese Variante wurde in einer Auflage von 22 Stück hergestellt und ausschließlich an die Gründungsmitglieder vergeben. Jetzt ist es durchaus so, dass wir uns als Gruppe auch durchaus selbstkritisch reflektieren. So mussten wir im Laufe der Zeit feststellen, dass es besser gewesen wäre, den Umgang mit „unseren“ Coins genauer zu definieren. Dieses Unterlassen führte dazu, dass die sehr begehrten Auflagen „The Friend“ und „The Supporter“ teilweise doppelt von uns verschenkt oder vergeben wurden oder durch Trades und Verkäufe irgendwann auch zum Weiterverkauf angeboten wurden – teilweise mit einer exorbitanten Gewinnspanne. Nun ja – die Coins waren Eigentum der einzelnen Gruppenmitglieder und jeder darf mit seinem Eigentum bekanntermaßen das machen, was er möchte. Das bezieht sich natürlich auch auf – einige und gewiss nicht alle – ehemaligen Mitglieder, die ja ihre Coins behalten durften. Bei der Gründung der Gruppe herrschte traute Gemeinsamkeit und es stand außer Frage, dass sich eines der Gruppenmitglieder jemals von seiner „The Beginning“ trennen würde. Und dennoch geschah es, dass – erstmals im Februar 2014 – eine komplette Edition aller bis dahin erschienen Coins bei ebay auftauchte. Innerhalb unserer Gruppe war das schon ein ziemlicher Schockmoment und die Preise sprengten unsere Möglichkeiten. Dennoch gab es einen uns gut bekannten Sammler, der sich entschied die Coins zu kaufen und in seine Sammlung aufzunehmen, bevor irgendjemand mit diesem Satz „Schindluder“ betreibt. Dort liegen sie nun sicher und wohlbehütet und ich glaube, dass die neuen Besitzer sich hoffentlich recht oft an dieser einmaligen Sammlung erfreuen – und das ist auch gut so! Und von diesem, mir erst seit kurzem bekannten (aber aufgrund ähnlicher Lebenserfahrungen sehr schnell liebgewonnen) Menschen erhielt ich ein unfassbares Angebot: Er wollte versuchen, die Coin im Rahmen seiner finanziellen Möglichkeiten zu ersteigern und an die Gruppe zurückzugeben. Dieses Vorhaben sollte zunächst einmal unter uns bleiben und einige der verbliebenen Gruppenmitglieder beschlossen schnell, den potentiellen Käufer bei seinem Ansinnen unter die Arme zu greifen. Der Rest der Aktion verlief reibungslos; sowohl Adoptionsantrag als auch Coin trafen zeitnah bei mir ein und ich bin mir sicher, dass auch die zugesagte Spende an die DKMS längst ihren Weg gefunden hat. Nun – Schlüsse könnte man daraus sicherlich mannigfach ziehen aber es würde im Nachhinein nichts mehr ändern. Wichtig ist nur die Erfahrung, die wir als Gruppe daraus ziehen können und die Hoffnung, beim nächsten Mal alles etwas besser zu machen. Translation provided by Jerry Kellum Sr. Sometimes people meet, form a club or an association and work together on goals that you have set for yourself and the group. Then one day for whatever reasons you come to a point where you – either by way of a consensus agreement, either for themselves or for the community and for themselves – decide that it might be better to leave this group. The SSoCA has had to experience this in the past, nothing extraordinary, but an all too familiar experience. Even in our small group of humans it is quite usual when there are discussions and people have different opinions. This is normal because nobody is perfect as we are only humans. The reasons to leave this group could not be more different and certainly it is sometimes unfortunate when a cherished friend decides to take this step. What remains is a gap that people only notice when it is there. Sometimes one person or the other may even be glad that there is more space and less opportunity for friction between people. But there always remains one thing that unites all funding members of the SSoCA. 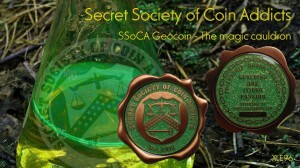 When the group was established, we decided to design a geocoin with our group logo (see also the article in SSoCA-Coinwiki) and to bring to the market. In addition to the „ordinary“ versions that were available, „The Beginning“ was also launched at that time. This version was produced in an edition of 22 pieces and given only to the founding members of the SSoCA. Now it is quite a way that we as a group are very critical on ourselves. So we found out that over time it would have been better to discuss and agree on the handling of „our“ coins in greater depth and detail. This omission led to the fact, that the very desired editions „The Friend“ and „The Supporter“ – which were donated or granted by us or offered through trades – came up for further trades or even resales at some point. But anyhow – these coins were the property of the individual group members and anyone can do with his/her property that he/she would like. This refers to some – not all – former members as well, as these coins retained as their property. With the founding of the group, there was trust and honor. There was no question that any single one of the group members would ever part with his or her very precious „The Beginning“. And then it happened – for the first time in February 2014 – that a complete set with all editions appeared on ebay for sale to the public. Within our group that was quite a shocking moment. The bids quickly became so expensive that it ruined our chances of purchasing these coins to keep in the group. Nevertheless, there was a well-known collector who decided to buy the coins and keep them in his personal collection before anyone else was able to buy these and possibly dishonor something very special to us. There they are now safe and well cared for and I know that the new owners are quite often enjoying this unique collection – and that’s a great thing! And with this, I only had recently met him (but due to similar life experiences I quickly grew very fond of), I received an incredible offer: he wanted to try to bid for the coin in the means of his financial capabilities and return it to the group. This plan was initially to remain amongst us, and some of the other group members quickly decided that they would help and support the potential buyer so he would not have to carry the complete burden on his own. The rest of the transaction was smooth; I received the adoption request and the coin very promptly and I am sure that the promised donation to the DKMS by the seller has already found its way there. Now – there are many conclusions one could draw from this, but it certainly would not change anything in the end. What is important is the experience that we have learned as a group. We hope and plan to do things much better in the future. 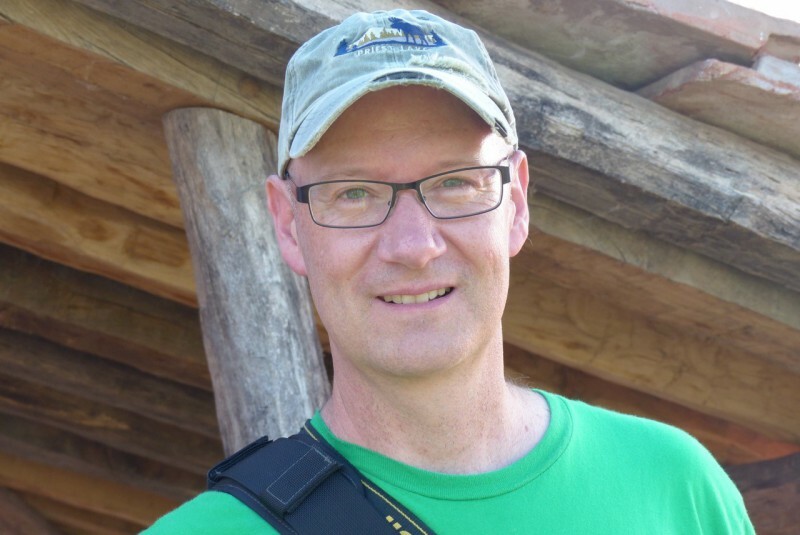 Cowboyhüte, Zapfsäulen, Waschpfannen aus den Zeiten der Goldgräber – Stephen Allen (Mo Pirate bei Geocaching.com) ist bekannt für seine sehr ausgefallenen Geocoindesigns. Vielen Dank an Stephen, der sich gern unseren Fragen gestellt hat. As we continue our series of Interviews with Coindesigners. 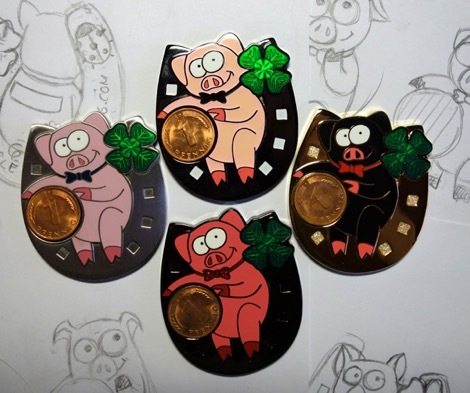 Cowboy Hats, Gas Pump Stations or Gold Pans – Stephen Allen (Mo Pirate at Geocaching.com) has created some very fascinating Geocoindesigns. We had the opportunity to talk to him. Interested in this interview with Stephen Allen (Mo Pirate)? Please click this link. 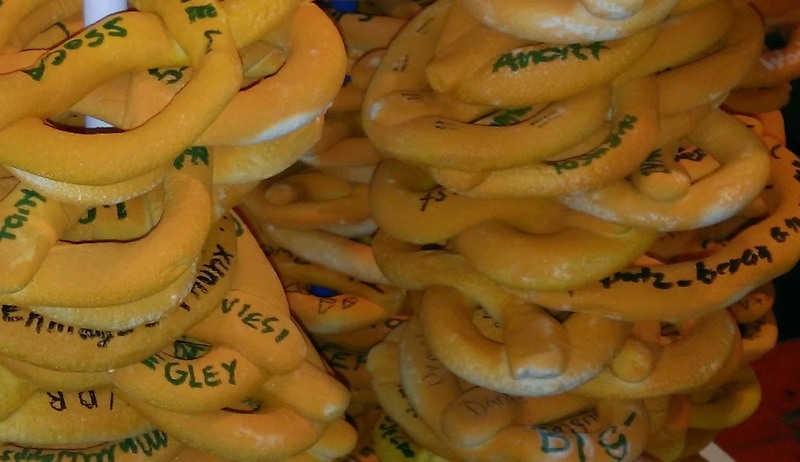 die SSoCA wünscht Euch von Herzen alles Gute, viele schöne neue Momente des Cachens und viele schöne Coins in Euren Sammlungen. Es war ein bewegendes und schönes 2014 mit vielen tollen Gesprächen und Momenten des Kennenlernens. Mögen diese Momente auch wieder in 2015 zu einem tollen Erlebnis führen. Wir bedanken uns bei all denen, die mit ihrem tollen Einsatz rund um unser all so geliebtes Hobby dazu beigetragen haben das das Geocoin-Wiki immer mehr Beliebtheit erfährt, die mit ihren Blogbeiträgen so tolle Momente festgehalten haben und besonderen Dank geht auch an mygeodb wodurch wir alle zusammengefunden haben. SSoCA would like to wish you all the best and many wonderful moments of caching and many nice new coins in your collections. It has been a touching and beautiful 2014 with great talks and moments of getting to know each other. 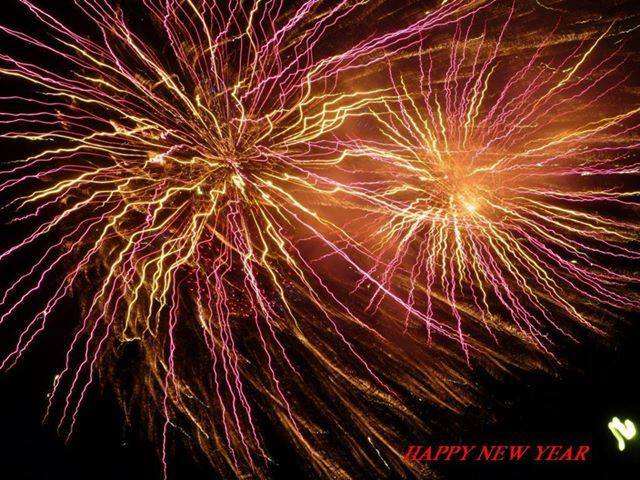 Will all these moments be continued in 2015. We say THANK YOU to all who have put emphasis in building up the Geocoin-Wiki with their posts and those who have brought geat joy with their blogs and also for the effort and work of the wonderful mygeodb where we all find together. In den letzten Tagen haben wir ein wenig unsere Webseite erneuert und hierbei einen Event-Bereich geschaffen, bei dem alle künftigen Events (größere und kleinere) gelistet werden sollen, die mit unserer gemeinsamen Coin-Leidenschaft zu tun haben. Damit wir aber immer auf dem neuesten Stand sind, brauchen wir Eure Mithilfe! Meldet uns einfach eure Coin-Events! Wir nehmen sie dann gern in unseren Kalender auf. Wieder neigt sich ein Jahr dem Ende zu. Wir wünschen allen Lesern unseres Blogs ein wunderschönes und möglichst streßfreies Weihnachtsfest sowie einen erfolgreichen Start ins neue Jahr. 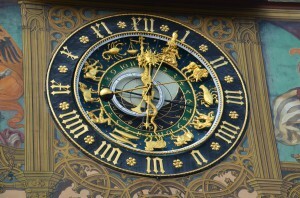 Am vergangenen Wochenende trafen sich Geocacher und Geocoinsammler aus der ganzen Welt in Ulm zum 4. Geocoinfest Europe 2014. Die Tradition der Geocoinfeste auf dem europöischem Kontinent reicht bis in das Jahr 2011. Hier fand das erste Geocoinfest EU in Köln statt. 2012 folgte ein Event in Portugal, 2013 in Prag und in diesem Jahr waren alle coinbegeisterten Geocacher nach Ulm geladen. Rund um den Veranstalter (sinusteam) hatte sich eine super Kern-Orga zusammengefunden (Frosti, M.ich.i, DieDickichtDugger, Gackerhaufen, dancer06, nasabebbel, ulmer-fw, Fräggae, octi, Newnoiseedition, Gastrospatz). Dieses Team hatte in einem Jahr eine hervorragende Arbeit gemacht. Für den reibungslosen Ablauf des Events sorgten zusätzlich 90 „Helferspatzen“, die mit hohem Engagement im Vorder- wie auch im Hintergrund fleißig wirkten. Ein herzliches DANKESCHÖN euch allen! 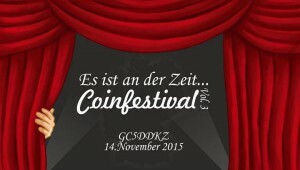 Den Auftakt zum Geocoinfest bildete am Freitag, 03.10. das Meet&Greet Event in der Reithalle. Bei diesem Event durften die Teilnehmer auch endlich die schönen Eventgeocoins, die Claudia von MyGeocoin.de zusammen mit der Orga entworfen hatte, in Händen halten und bewundern. Auch für das leibliche Wohl war bestens gesorgt und ohne lange Warteschlangen, wie auf manch anderen Megas, konnte nach einem schönen Cachetag das gemütliche Zusammensein gepflegt werden. Es wurden viele tolle Gespäche geführt, neue Kontakte genknüpft und alte gefestigt. Als Logbuch durfte jeder mal wieder in das Hobby der Papier-Falt-Technik (Origami) einsteigen und Dank der Helferspatzen, die hier mit ihrer Kreativität die Teilnehmer unterstützten, entstand eine Karawane von kleinen Papierbooten auf der gemalten Donaulandschaft. Neben den vielen Gesprächen war aber auch der Grundgedanke dieses Eventwochenendes das Zeigen und Tauschen von Geocoins und so saßen die Gruppen zusammen und packten ihre Taschen und Koffer aus, um die schönen Geocoins und Tokens in allen Variationen zu zeigen und zu tauschen. Beim gemütlichen Bier und guter Unterhaltung klang der Abend langsam aus und sorgte so für einen gelungenen Auftakt. Der Samstag war dann das Highlight des Wochenendes. Pünktlich um 9 Uhr eröffneten Ben&Jayme von Groundspeak HQ mit einer kleinen Ansprache das Geocoinfest. Es wurde das rote Eröffnungsband durchgeschnitten und die „Coiner“ strömten in Scharen in die Geocoinhalle. In kürzester Zeit waren die Stände der Shops belagert und es wanderte ein Coin nach dem anderen in die Taschen der Besucher. Neben Geocoins wurden natürlich aber auch noch viele andere Sachen, rund um das Thema Geocaching angeboten und verkauft. Auch an diesem Tag war das Catering wieder hervorragend und es zeigte sich, dass die Orga hier absolut alles richtig gemacht hat. Neben den vielen anwesenden Shops, konnte in einer Nebenhalle des Roxy auch wieder dem Tauschen und Discovern gefrönt und Kontakte gepflegt werden. Anhand der sehr vielen glücklichen Gesichter läßt sich schließen, dass es eine sehr gelungene Veranstaltung war. Das Logbuch wurde aus vielen bunten hölzernen Spatzen gebildet, auf denen die Besucher ihre Namen verewigen konnten – eine tolle Idee, die perfekt zu Ulm paßt! 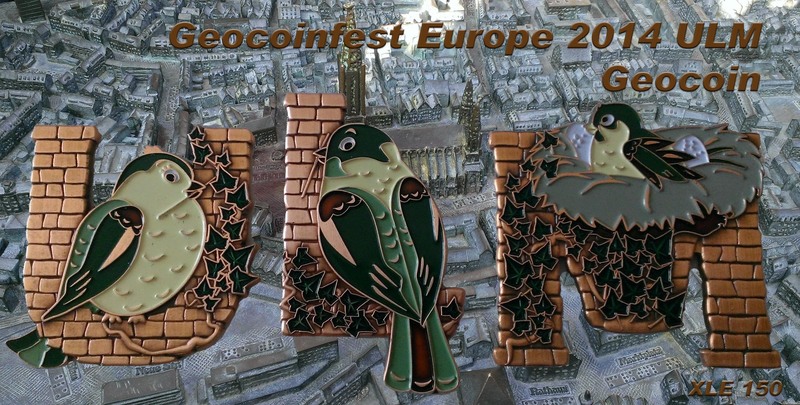 Als dann um 16.00 Uhr das Geocoinfest offiziell den Ausklang fand, wurde dann noch von Avroair und Longtomsilver das kommende Geocoinfest 2015 in Europa bekannt gegeben: Die Geocoinwelt ist zu Gast in Eindhoven/Niederlande vom 25. – 27. September 2015 – ein Termin, den man sich auf jeden Fall vormerken sollte. Am Abend sorgten die Dosenfischer mit einem Konzert im Roxy für ausgelassene Stimmung und sorgten somit für ein weiteres Highlight an diesem Tag. 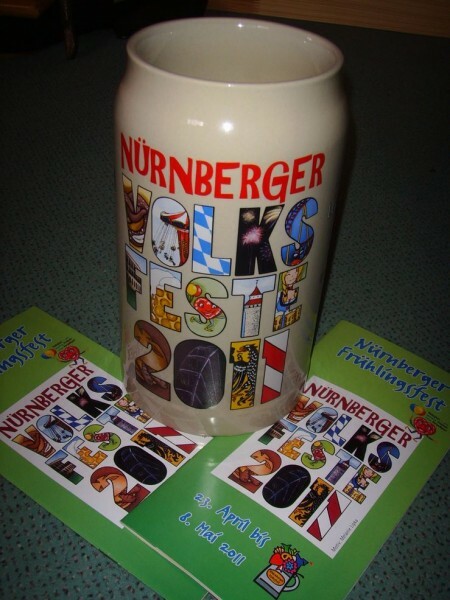 Mit einem GEOktoberfest fand das Geocoinfest dann am Sonntagvormittag einen zünftigen Ausklang. Im Zeughaus wurde bei Blasmusik und Weißwurst im Herzen der Altstadt gefeiert. An zahlreichen Ständen konnten die Besucher ihr Geschick unter Beweis stellen und mit einem Quäntchen Glück auch die ein oder andere Geocoin gewinnen. Brezen aus Salzteig bildeten hier das Logbuch und vermittelten die bayrische Lebensart des benachbarten Stadtteils Neu-Ulm. Auch hier sorgte die Orga mit ihrer hervorragenden Planung und zahlreiche Helferspatzen für einen reibungslosen Ablauf auf dem Event. Ein besonderes Highlight während des Geocoinfestes war die Ausstellung der Privatsammlung von Christian Bathe. Unter dem Motto „Biggest collection of Ernie’s Geocoin’s“ konnten alle 371 Geocoins des schweizerischen Geocoindesigners ernies bewundert werden. Jeder Geocoinsammler, der jemals versucht hat, seine Sammlung zu einer Serie zu komplettieren, wird wissen, welche Leistung dahintersteckt, eine komplette Sammlung in dieser Größenordnung zu einem einzelnen Designer aufzubauen. 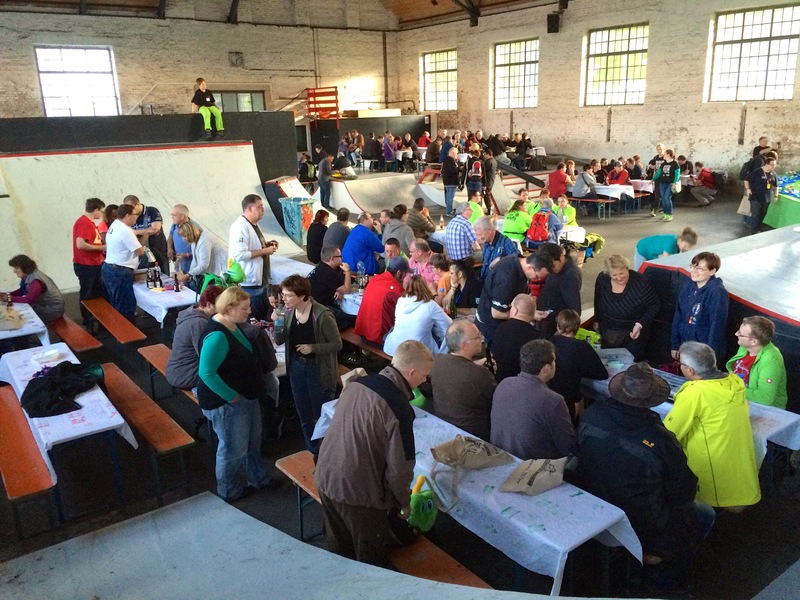 Einen ausführlichen Bericht vom Geocoinfest in Ulm findet hier auch auf dem Blog von Geocaching Baden. Natürlich waren auch viele Mitglieder der S.S.o.C.A. als Besucher des GCF zu Gast. Im Vorfeld hatten wir eine besondere Überraschung geplant, die wir Dank der genialen und professionellen Arbeit von Claudia von MyGeocoin.de verwirklichen konnten. Ein herzliches Dankeschön an Claudia! Pünktlich zum Festauftakt erschienen zwei neue Editionen der S.S.o.C.A. Geocoins: „The magic cauldron“ (96 XLE) und „The end of the rainbow“ (191 XLE). Beide Versionen werden nicht im Shop verfügbar sein, sondern befinden sich in den Händen der Mitglieder. Häufig erreicht uns die Frage, wie man eine dieser begehrten Coins ergattern kann und ob es gewisse Regeln beim Verteilen bzw. Verkauf oder Tausch dieser Coins gibt. Daher hier eine kurze Erklärung von unserer Seite: Jedes Mitglied der S.S.o.C.A. trifft allein seine eigene Entscheidung! So werden manche Coins z.B. als Dank für ein vorbildliches und besonders faires Verhalten in der Coincommunity verschenkt, andere gegen Coins oder Muggelcoins getauscht. So konnten wir einige von euch bereits auf dem Geocoinfest mit diesen neuen Editionen überraschen und erfreuen. Wir hoffen, daß der Spirit, der diesen Coins innewohnt, euch zu fairem und freundschaftlichen Handeln ermuntert. Neben dem Geocoinfest EU in Eindhoven 2015 solltet ihr euch noch einen weiteren Termin in eurem Kalender vormerken. Ein „kleines“, bewußt nicht als Mega geplantes Event möchte am 14. November 2015 in Nordhessen die Geocoiner zusammenführen. 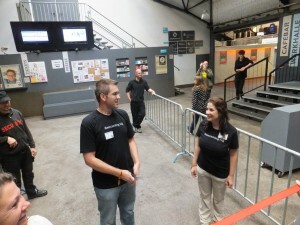 Das Coinfestival Vol.3 setzt die Reihe der bereits im Jahre 2010 und 2013 in Berg (Bayern) gestarteten Coinfestivals fort und wird nun das dritte Event dieser Art sein. Unter www.coinfestival.de werden in den nächsten Wochen alle näheren Informationen verfügbar sein. Vielen Dank an sax114, DocBrwon13 und NickyBJ, die uns neben einigen Mitgliedern der SSoCA für diesen Bericht ihre Fotos zur Verfügung gestellt haben! Wir freuen uns euch eine neue Ausgabe der beliebten Serie „Interview mit Coindesignern“ präsentieren zu können. Stephanie Witham alias Tsunrisebey und ihre wunderschönen Geocoins stehen im Mittelpunkt dieses Artikels. Vielen Dank, liebe Ursula Grass (Wuselelfe), für diesen tollen Gastbeitrag in unserem Blog!